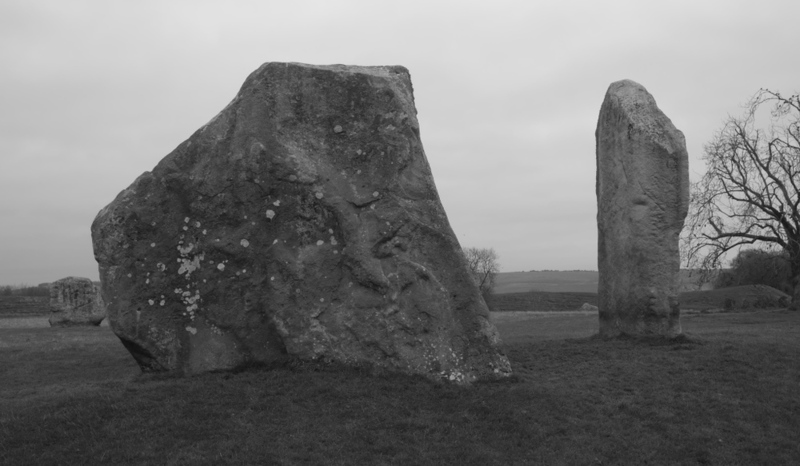 I had to take my daughter to Wiltshire yesterday and had a few hours at Avebury, probably the most impressive prehistoric site in Britain - indeed anywhere in the world. It was a windswept, overcast afternoon, good for black and white photography. Several of the stones you see here had fallen and have been re-erected, but some have stood since they were first raised almost five thousand years ago. That's about the same period as the Egyptian pyramids, and it's worth reflecting that one of the stones at Avebury - the huge slab in the image above - weights at least 100 tonnes, some 40 times the average weight of the blocks in the pyramids. You don't have to go to exotic lands to marvel at the capabilities of prehistoric people, and their ability to put enormous effort into works with no apparent practical purpose. That's one of many points of similarity between these sites and medieval cathedrals. Another, the sense of containment - of security from the world outside - seems particularly apparent within a well-preserved henge such as Avebury, with its original ditch far deeper than the moats of many medieval castles and the surrounding mound blocking off the view of all but the distant ridges of the hills beyond. For me, used to a pretty good internal compass, walking around the stones can induce an unfamiliar sense of disorientation, something probably brought on by the offset location of part of the village within the circle and by the fairly uniform horizon of the surrounding hills. In an overcast sky, it can be difficult to find your bearings. Perhaps this 'otherness', and not only celestial alignments, was what made these places work, and allowed a spiritual world to be more easily accessed - not much different from the purpose of the church you can see beyond the stones in the final photo below.